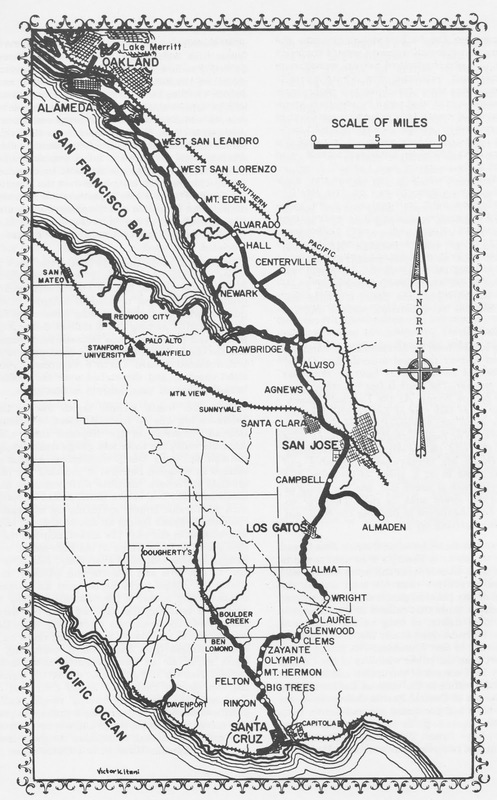 From the time that the Southern Pacific Railroad Company first entered the Pajaro Valley in 1869 until their ultimate merger into the Union Pacific Railroad in 1996, their main method of expanding routes and acquiring properties has been via wholly-owned subsidiary companies and entirely fictitious paper companies. This is a brief chronological history of those corporations. Acting as one of the first major paper company of the nascent Southern Pacific Railroad, this short-lived corporation was founded on January 2, 1868. Its initial goal was to connect San José to Gilroy via a 30-mile-long track; however, it accomplished this entirely by means of Southern Pacific Railroad machinery, rolling stock, and even property deeds. The precise reason for this company's existence, therefore, is highly questionable. It seems that the main purpose was to lessen fears by local land owners that their land was being purchased by the rapidly-growing Southern Pacific Railroad. If this were the case, they largely failed as local newspapers reported the railroad's construction progress under the name Southern Pacific and it seems unlikely that the plan deceived many. The route was opened to Gilroy on March 13, 1869. Through the completion of this route, railroad traffic could flow fluidly between Gilroy and San Francisco using another subsidiary, the San Francisco & San José Railroad, which ran along the inside south-western edge of the San Francisco Bay (as it still does today). This route also anticipated the railroad's next move into the Pajaro Valley. The railroad was merged into the Southern Pacific Railroad Company in October 1870 and became an essential part of its original trunk line. This paper company which was incorporated in early 1870 appears to have existed for the sole purpose of purchasing land along the future right-of-way between Gilroy and Pajaro, as well as trackage to Hollister and even possibly into the San Joaquin Valley. In reality, this company never appears to have operated any trackage or rolling stock, and its short life suggests the entire idea of this railroad was a mistake or that the railroad had served its purpose in a short manner of time. Nonetheless, it, along with the Santa Clara & Pajaro Valley and the San Francisco & San José railroads were merged into the Southern Pacific Railroad Company in October 1870. Another subsidiary in Southern California would later pick up the name "California Southern" and operate using that throughout the 1880s. The trackage between Gilroy and Hollister was built next by the Southern Pacific directly in 1870, while a branch line was completed to Pajaro on November 27, 1871. Soon afterwards, plans to continue through Hollister into the San Joaquin Valley were abandoned and the Pajaro route became the new mainline track. 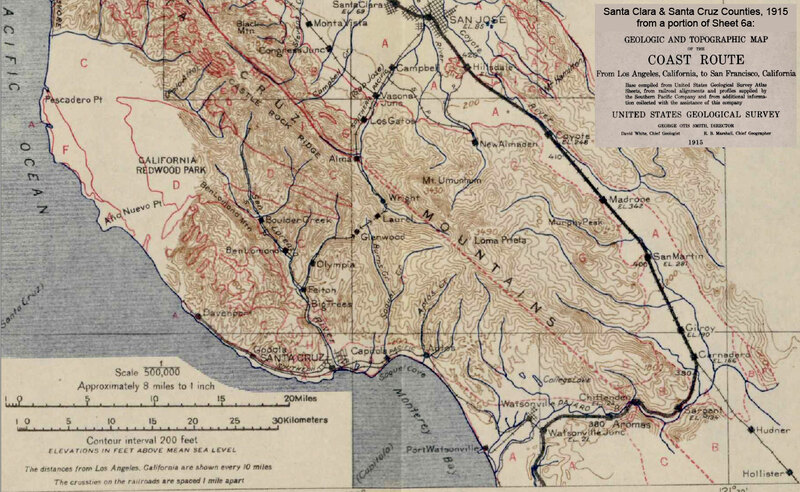 The route was extended to Salinas and completed November 1, 1872. All three of these later construction projects were done directly through Southern Pacific rather than through a subsidiary. The somewhat failed experiment that was the Monterey & Salinas Valley Rail Road Company met its end on December 22, 1879, when the Southern Pacific purchased the company at auction. Even before the company was founded, however, Southern Pacific crews were already grading and laying rails between Castroville and Bardin (Marina), where the Monterey & Salinas Valley track turned to Salinas. Once the line was purchased by Southern Pacific, the new Monterey Railroad Company abandoned the 6.4 miles between Bardin and Salinas and replaced them with the new route between Castroville and Bardin. At the same time, they upgraded all of the track to standard-gauge. The original route between Salinas and the Monterey Wharf, therefore, became a new route between Castroville and the wharf. This company was formally merged into the Southern Pacific Railroad on May 14, 1888, and became the Monterey Branch of the Coast Division. The Loma Prieta Railroad was actually the first dedicated standard-gauged railroad constructed in Santa Cruz County. Although technically founded as an independent company, in reality its board of directors were Southern Pacific executives and its operation was built off of the Santa Cruz Railroad track which had been acquired by Southern Pacific in 1881. The construction of the Loma Prieta Railroad route took the better part of two years from its incorporation on July 10, 1882, and much of the route was built dual-gauged with plans to remove the inner track once the mill itself became operational. That railroad's operational life began on November 13, 1883, but the railroad had to wait for its primary patron, the Loma Prieta Lumber Company, to get its act together first. The company formed on November 14—the very next day—but it was not able to begin operations until the following spring. The railroad, sitting largely idle during this time, only came into regular use beginning June 2, 1884, and the next day, the Loma Prieta Railroad Company ceased to exist and became the Loma Prieta Branch of the newly-formed, wholly-owned Southern Pacific subsidiary company, the Pajaro & Santa Cruz Railroad. Incorporated on June 3, 1884, through the merger of the once-independent Santa Cruz Railroad and the Loma Prieta Railroad, the Pajaro & Santa Cruz Railroad was a convenient shell company of the Southern Pacific Railroad to manage its original Santa Cruz County trackage. In most cases, the two former railroads continued to operate under their former names in this time. Little construction was done on the line during these years, either, except for a two-mile extension of the Loma Prieta Branch which connected the mill to the harvesting area at Monte Vista (#1). This company was formally merged into the Southern Pacific May 14, 1888, after which it operated briefly as the Santa Cruz Division and then as the Santa Cruz Branch and the Loma Prieta Branch. The Santa Cruz Branch remains the operational portion of track in Santa Cruz County between Watsonville Junction and Santa Cruz Station. In 1887, James Fair, the president of the South Pacific Coast Railroad Company, the Felton & Pescadero Railroad Company, the Santa Cruz & Felton Rail Road Company, and a number of other Bay Area operations, decided that he wanted to retire from the railroading business. On May 23, he consolidated all of his various subsidiaries into the unified South Pacific Coast Railway Company and then, on July 1, 1887, sold most of his shares in the organisation to the Southern Pacific Railroad, essentially turning it into a wholly-owned subsidiary of the latter. For two decades, the South Pacific Coast operated virtually autonomous from other Bay Area systems due to the narrow-gauged nature of its tracks. During this time, the route was known alternatively as the South Pacific Coast or the Coast Division—Narrow Gauge, but as the first decade of the 1900s continued, the tracks were slowly converted to standard-gauge and eventually the route lost its separate identity. When it was formally merged into the Southern Pacific Railroad Company on December 2, 1937, few people noticed. Most had assumed the company had been absorbed thirty years earlier. Much of the trackage remains today throughout the Bay Area. In Santa Cruz County, however, only the Roaring Camp Railroads-owned track between Eccles and Santa Cruz Station survive. An ambitious plan to extend the Monterey Railroad track to Carmel was seized by the Southern Pacific when on January 6, 1888, it incorporated the Monterey Extension Railroad Company. In reality, this appears to have been no more than a paper company intended to purchase the necessary rights-of-way between the Monterey wharf and Carmel, a route planned to pass through Pacific Grove. However, on May 14, 1888, this line, too, was merged into the parent Southern Pacific Railroad, which then became responsible for extending the line. This route was finally begun in late 1888 and completed to Lake Majella in 1889, but no railroad line ever reached Carmel. In 1905, competition to create and complete a route connecting Santa Cruz to San Francisco along the coast was heating up. The Ocean Shore Railway (later Ocean Shore Railroad) was founded earlier that year with this goal in mind. The Southern Pacific, which wanted to ensure it had primacy along the coast, especially the clientage of the lucrative cement plant being constructed in Davenport, incorporated their own rival company, the Coast Line Railroad, on April 15, 1905. Although on paper, this new railroad stated its desire to connect to San Francisco and to Pescadero (from where another track was planned to extend to Boulder Creek), in reality Southern Pacific was just playing a game with a rival. The Coast Line and Ocean Shore routes were built side-by-side and in tandem by the same developer to Davenport, with the Coast Line claiming the east side patrons (which included the cement plant). Throughout the 1910s, the Ocean Shore haemorrhaged until it finally closed. The Coast Line, meanwhile, was merged into its parent on October 9, 1917, its purpose fulfilled. The route never extended beyond a wye beside the Davenport cement plant and any plans to extend the track to Pescadero were cancelled after the 1906 San Francisco Earthquake forced the Southern Pacific to reallocate resources to more immediate concerns. This route survives today as the former Davenport Branch, or rather the portion of the Santa Cruz Branch between Santa Cruz Station and Davenport. 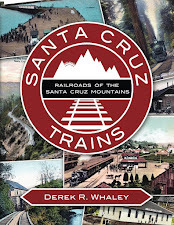 Unbeknownst to any at the time, the Coast Line Railroad ended up being the final Southern Pacific subsidiary line incorporated in Santa Cruz or Monterey counties. After 1937, all railroads in the county were owned directly by the Southern Pacific Railroad Company, a fact that would remain until 1996 when Southern Pacific itself absorbed the Union Pacific Railroad Company and was rebranded as the latter. Daggett, Stuart. 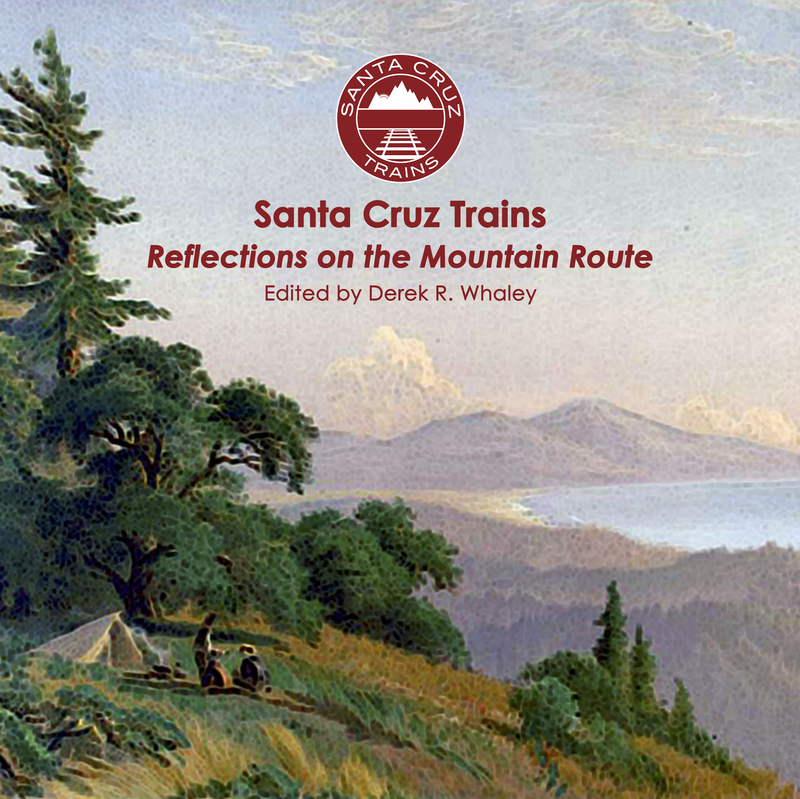 Chapters on the History of the Southern Pacific. Berkeley: Library of Alexandria, 1922. Hamman, Rick. California Central Coast Railways. Santa Cruz, CA: Otter B Books, 2002. 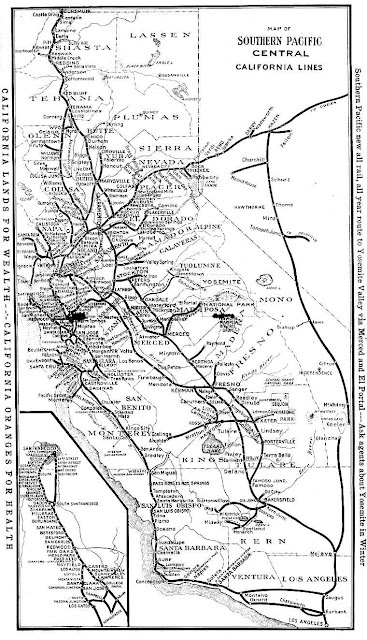 Robertson, Donald B. Encyclopedia of Western Railroad History: California. Caldwell, ID: Caxton Press, 1986.